Friends are sacred to me. I like having many friends and enjoy the good company. But having friends goes along with a price. The joy of having friends is indescribable but have to face a great pain when seeing them go. That's part of having friends; to meet and to depart. I always wish friends are for keeps though the reality is some friends come and go like passing clouds. I miss some friends whom I crossed paths once and whom I don't see anymore. To all my dear friends, this is my hope for a true meaning of friendship. when spread on the bread, we can click together. She will be by my side to let it go by. That shoos the gloominess from this soul of mine. But I'm glad, my friend gives a hand for me to hold. My friend puts back the torn pieces like what it used to be. My friend will always be there to give me shelter. You all are my priceless jewel forever. Good friends will always be there for us, come rain or shine. Wonderful poem! yes. friends are treasures. A friend is a precious source of happiness. It's not always measured by distance, but rather the happiness you have inside you when you remember your moments together and that smile on your eyes when you see them again. Hi, Balqis. So thoughtful and touching.. It's been a long time since I was inspired to write a poem about friendship. But...you're selfish...you let others drool watching you eating up yourself!! Hehehe...nothing for them! Why don't you throw a piece of it to the bee so that it won't sting you?? @Issa - Thank you so much for your nice comments. I'm inspired to write it when thinking of friends who play a great part in making me enjoy this otherwise lifeless life. hi balqis, this is really a fantastic piece of poem for a friend.. how lucky your friends are to have you around. You must be the kind of friend, where they will always say "WISH YOU WERE HERE" whenever they have good things or dificult moments to share. To me, you are a friend too...so far yet so near. have a wonderful day balqis, God Bless you. hello Balqis..I miss you..I have been sick again huhuhu..
@Sie - Dear sis, I'm sorry to hear that you were sick. I hope you're recuperating. I value friendship, too, and how much it means to me. I'm always happy meeting new friends but will be in deep sadness when they are gone. I mean, after certain time, don't hear from them and lose contact. This is part of life. This is great! We can make friends anywhere but true and real friends are only few and limited. Seeing them go is really pain..
wow. im in awe now. great one. the picture draws my attention because i have that kind of pic in one of my entry. 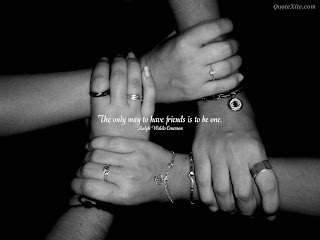 It's so sweet, Balqis... Friends are the best thing in my life, too, especially my best friends. Amazed by your words of expression... You penned down those feelings in my heart so precisely that i felt it complete!! I am gonna share this blog to my friend!! Thanks!!! Glad to catch up a fellow blogger from Malaysia.. Though I have heard a lot about the country, I have never had a chance to 'know' the country well. Friends are the diamonds on our crown... Behavior of our friends portrays the behavior of ourselves as well. As A Muslima, I believe I must chose friends who 'shine' with virtues and good deeds... Who reminds me of Almighty God, who motivates me to do everything good for everyone around...right? Friendship can become so meaningful, true friends inspire you to keep going and loosing an inspiring friend can be truly painful. You're right. Some friends could make differences in our lives. I appreciate your comments.